Description: The incomparable range and imagination of Czech artist Peter Sis is known the world over through his animated films, paintings, and best-selling children's books such asKomodo!, The Dragons Are Singing, and Follow The Dream. 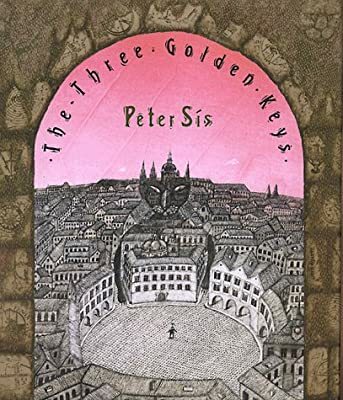 Now, with The Three Golden Keys, he gives us his most heartfelt and autobiographical work to date: the reworking of three classic Czechoslovakian fairy tales into a haunting illustrated fable of his lost childhood in Prague that is also a deeply felt allegory of the reclamation of a Czech cultural identity after forty-five years of Communist rule. A man returns to his home in the ancient city of his childhood. Three large rusty locks bar his entry. He knows he must somehow find the three golden keys that will let him in. Suddenly a black cat leaps off the gate; seeming to invite him to follow. Together they search through Prague's monuments and landmarks. With each key they find, a different aspect of the city comes to life and recounts for them a classic Czech fairy tale. The man runs back to his childhood home and excitedly opens the three rusty locks. Inside the front door, back turned to him, is his mother. She glances up, and as she recognizes him and comes to life, so does the city. Utterly magical on every level, The Three Golden Keys is destined to become a classic of children's literature. It truly is a "book for children of all ages."